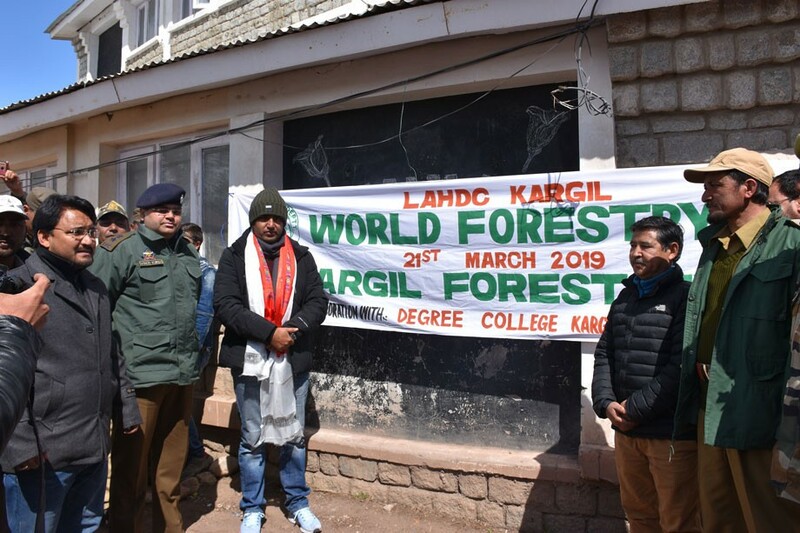 In connection with World Forestry Day 2019, a plantation drive was launched by Baseer-ul-Haq, DC on March 22 at Degree College Kargil. The plantation drive was organised by the Forest Division Kargil in collaboration with Degree College Kargil. 1 lakh saplings will be planted at various locations within two months. Baseer-ul-Haq said that the plantation drive has been launched to enhance green patches in the district which is having only 0.05% green covers. The initiative will increase forest cover of the district and will also prove helpful in mitigating the ill effects of climate change and global warming. He urged people especially students to work as ambassadors to carry forward the mission of plantation at their own level by planting saplings at schools, college and homes. Also, he stressed upon every student to adopt a plant to enhance the chances of survival of the saplings. He informed that all necessary measures would be put in place to ensure proper upkeep of the plants so that the plantation drive does not remain confined to the planting of saplings only. DC also said during current plantation season, efforts will be made to involve other Government departments apart from the Forest Department and the common citizens so that the mission of tree plantation is carried forward in the district. Dr. Vinod Kumar, Superintendent of Police also spoke on the occasion and advised students to plant more and more trees and contribute their bit in saving earth from the danger of disasters. Meanwhile, the college authorities projected several demands like the provision of a playground, landscaping, early functioning of tribal girl’s hostel, construction of a college auditorium and other related demands. Baseer-ul-Haq assured the college authorities for requisite steps. Students spoke on the importance of afforestation for human survival and lessening the impact of climate change and global warming.